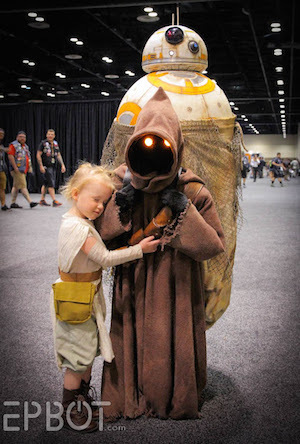 EPBOT: February Art Roundup: Princesses, Wombats, Robots, & More! 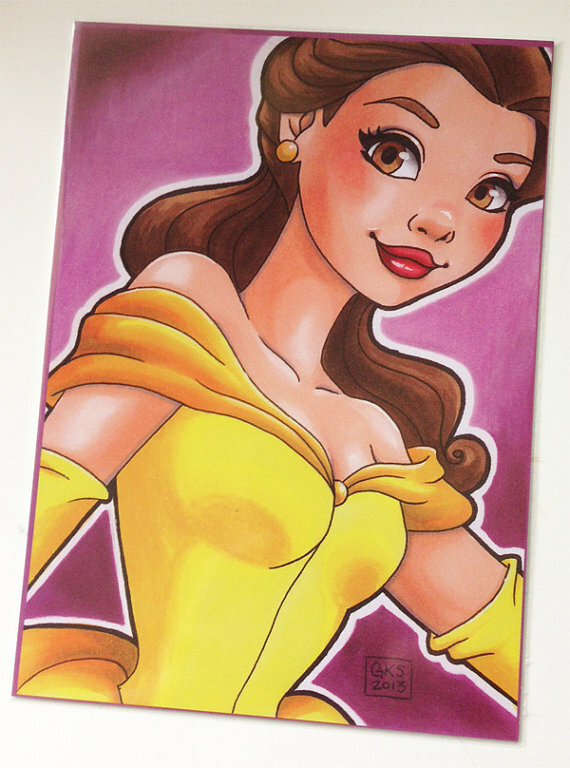 February Art Roundup: Princesses, Wombats, Robots, & More! Time to dive back into some geeky art goodness! And get this: these postcard prints are only $2 each! Lots more beauties to choose from, so head over to her Etsy shop to see the rest. You can buy the originals here at her online store, but I don't see any prints available, so that makes me a sad panda. :( Follow Ania on Facebook for more. 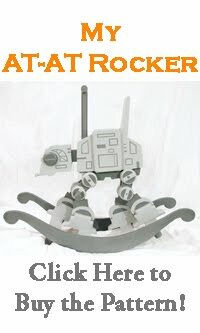 Robots, cake, AND dinosaurs? Is this heaven? I don't think Westin has an online store, but you can check out his blog here. These are all by Jordan-Alexander Thomas, aka Space Boy Robot. Aren't they great? Follow him on Facebook for more. Prints start at just $10 over in her Etsy shop, Meluseena. 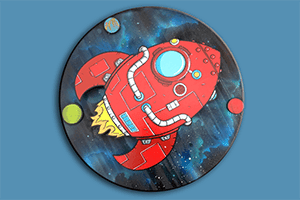 My friend Jason over at Red Rocket Farm is doing something new: he's using his art panels to tell full stories over on Facebook, releasing a new panel every few hours for a number of days at a time. The story that's wrapping up this week, To Lumber Home, made John furious, but then by the very next panel (which came out the next day) he was crying happy tears - so I figure anything that sends John on that much of an emotional roller coaster needs a mention. Ha! You can read the whole story in order here on Jason's website. The classic "SplatBot," which I've featured before. My new favorite. Yay rocket ships! And this is the shirt John wears the most. Have I mentioned Jason's twisted sense of humor? The set of 2 5X7s is $14, or you can get larger sizes, too. 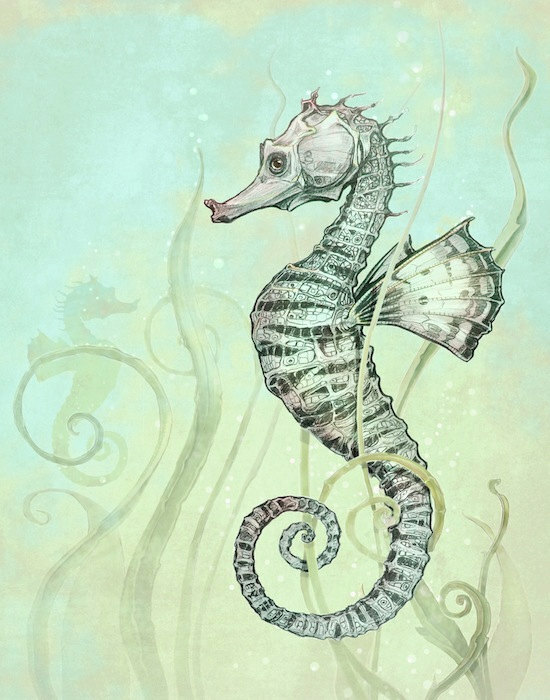 But this seahorse print is new to me! Those colors! 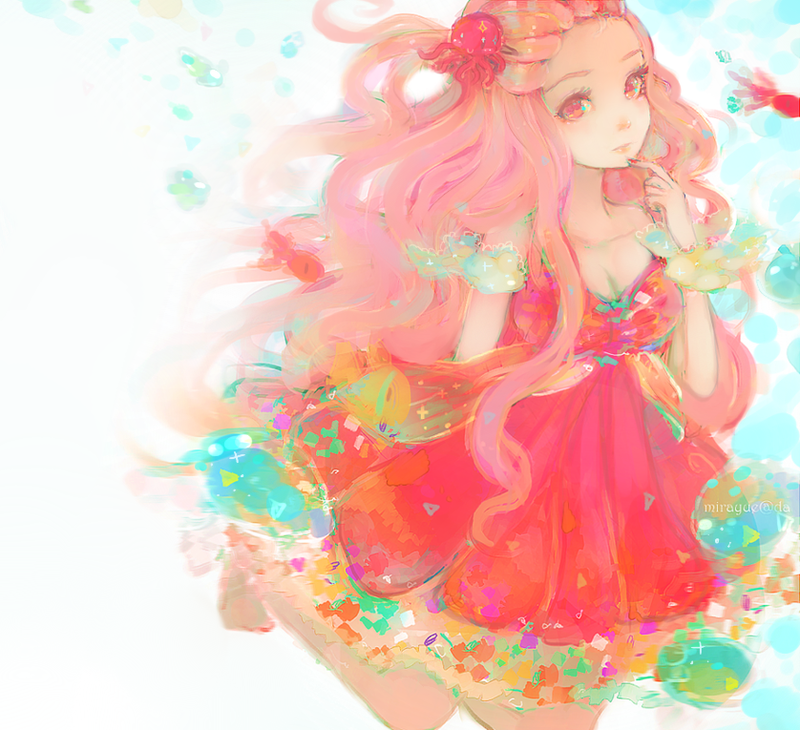 Go see the rest of her work over on DeviantArt. Love that retro poster design! There's so much more cute to see, so go check out Jerrod's site for the rest. K, guys, that does it for this month! Now, as always, be sure to comment below for your chance to win your choice of free art from my Pinterest Art Give-Away Board! I add to the board every month, too, so take a looksie if you haven't been over there in a while. I'll announce my randomly selected winner in a few days, and I'll ship anywhere, so internationals are welcome. Happy commenting! 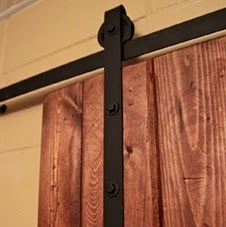 Congrats, guys, and please e-mail me your mailing addresses & choice of prize from the give-away board! Love the Minnie/Mickey carousel print--especially for my 2-year-old daughter who's just learned how to say "Minnie Mouse" in her own way. You have a great eye, Jen! So much awesomeness! I must have the carousel prints to go with my carousel collection. My sister-in-law has that Ollie shirt. Love it! One of these months I will be a winner ... Keeping my fingers crossed. I love the Baymax one and the Mickeys. Adorable. Also, that sloth. Who knew it could be so cute!? It doesn't look like To Lumber Home is finished. 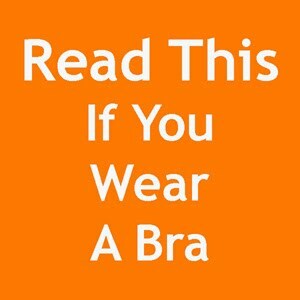 I definitely shouldn't have read it at work though. Oooooh,drooling over all this gorgeous artwork! I love the ollie shirt. I would wear it all the time. I also love the Princess Jellyfish art those are just wonderful. The princess prints you listed at the beginning -- thanks for posting those! Will show to my daughters later today. So many pretties, so little wall space... But my 4 year-old loves dragons, so I'm sure we'd find space for Toothless or the Blue Dragon in her room if they were to arrive in the mail. She's even decided that I will be her pet dragon at our next con: she'll be (steampunk) Elsa, and I'll be Ice-Icer-than-Ice, which is obviously what Elsa's dragon's name is. Roar! Thank you for inspiring me to dress up for cons. It's so much fun! Great stuff as always. Have you ever played the game-with-cards (not really a card game) Dixit? A lot of your picks this month would fit in really well with the art in that game. 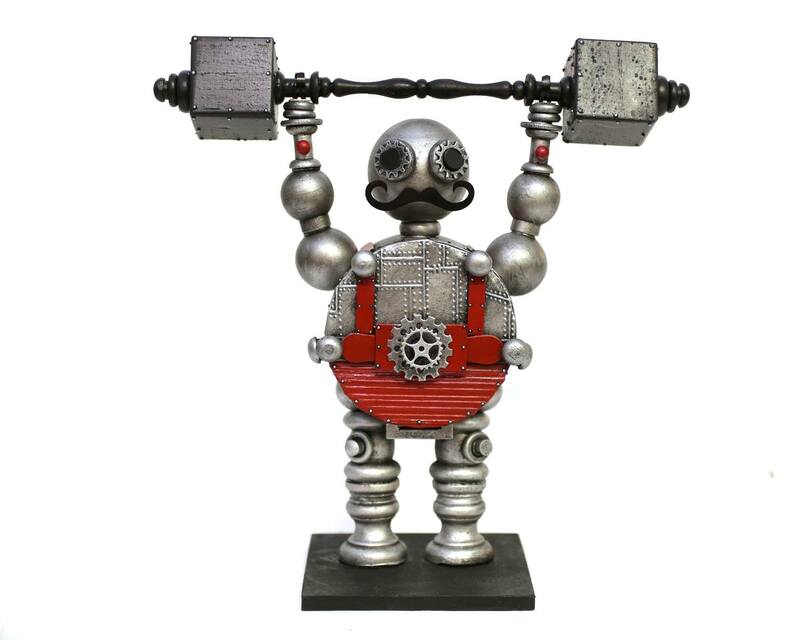 Always an amazing array of artists who may not ever be noticed otherwise.. My favorite though, is the robot sculpture of the strong man- too freaking cute!! Yay for the Art Roundup! Baymax in Mickey ears is adorable! Love it! 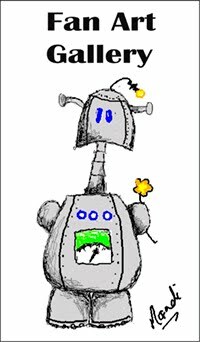 Such cute robots! Perfect for the nursery we are putting together! The Genevieve Kay Etsy shop is sooo bright and colorful. One of everything please!! I love when you do your art roundups. I've been introduced to so many new and talented people! Jen, I just love that you feature so many artists on here! I don't buy much art (ok...I don't buy any), but some day I hope to start. 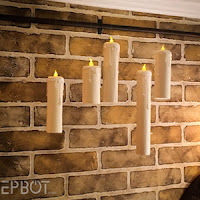 I just wish I was as creative as you in knowing just HOW to use art around the house!!! <3 you! SO many beautiful features!! 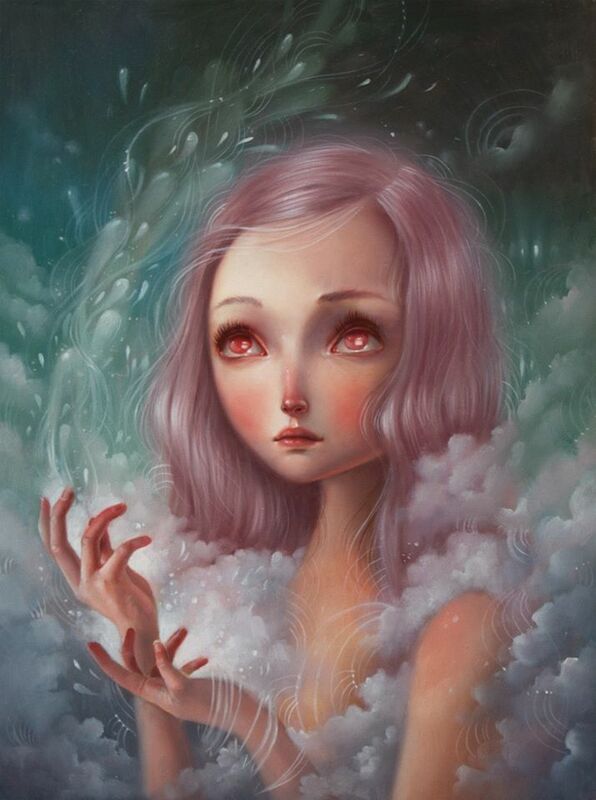 So happy to see an art roundup (I'm a relatively new follower!) - not the most common thing and I adore finding new artists to watch! Thanks! 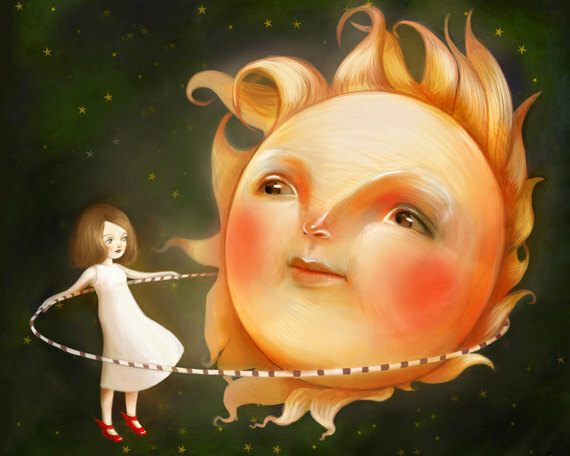 These art roundups always lift my spirits. Thank you for doing them! 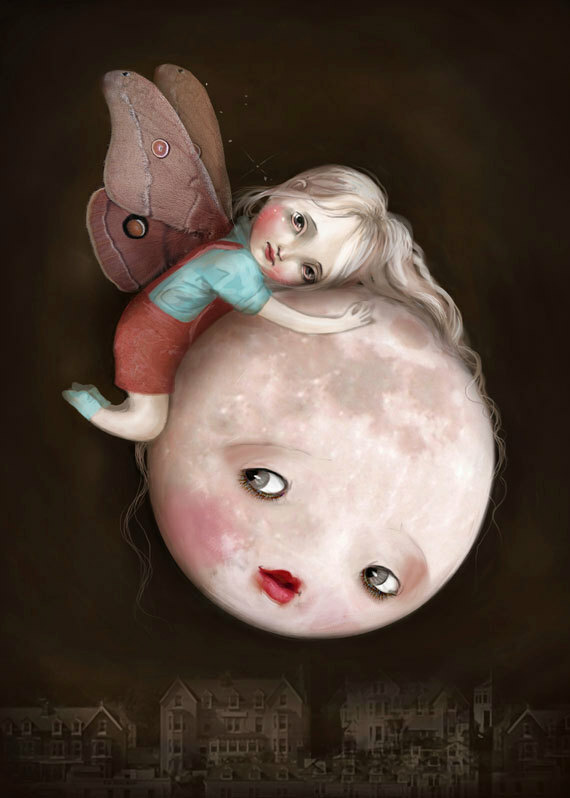 I always love your art roundups, Jen! You find the best prints! Thanks! Haha, Baymax in Mickey ears is adorable! 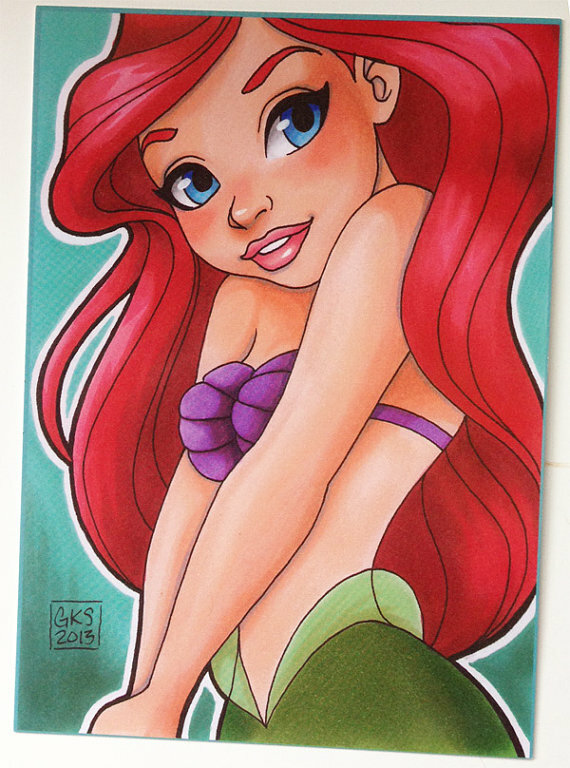 I think I'm gonna have to pick up some of those Disney princess postcards. I'm developing a huge collection of postcards I want to display...now I just have to figure out HOW to display them. Thanks for another fantastic selection of art! The steampunk carousel prints are especially amazing! I love. love. love the retro Guardians poster! I'm not sure my last comment went through, so sorry for the duplicate, but I NEED to win Mickey and Minnie. Also having commenting issues- hopefully one goes through! 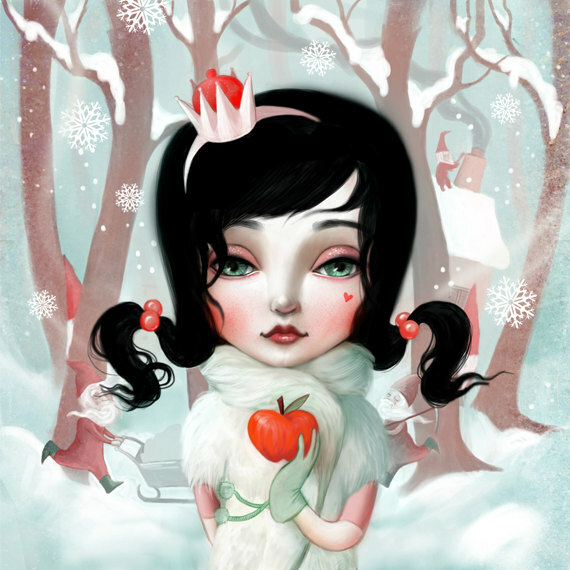 I just ordered 4 of the postcard prints from Genevieve Kay's store! Thanks so much for all of these links; so much amazing art out there. I love the Disney stuff! And the wombat, too cute!! Awesome stuff yet again. Thanks for sharing! You always find such beautiful and interesting stuff! Thanks for doing this! baymax in mickey ears... finally watched big hero 6 last night... need! You find the best art! And I still want the Believe TARDIS piece from the giveaway board! I am a random commenter! I also went and read To Lumber Home and SOBBED MY HEART OUT at my desk, thank you for that. Rollercoaster is RIGHT! Doctor Who is first on my list, but that little Toothless reminds me of my five month old grandson -- anything would be delightful. Oh man, I am drooling over the Princess Jellyfish and steampunk carousel art! Princess Jellyfish is definitely one of my favorite animes. I just get such a kick out of Kuranosuke!! Love your taste in art! Seahorses! Love the carousel prints and of course, Toothless! The octopus carousel print is beautiful. And I love John's favorite shirt too! Oooh, such pretty work this time! <3 Your art round ups! Love the Mickeys! So cute! So many awesome artists out there - thank you for introducing us to these artists and for your generous giveaways! Old-timey Mickey and Minnie are overflowing with adorableness. I wish I lived closer to the parks... 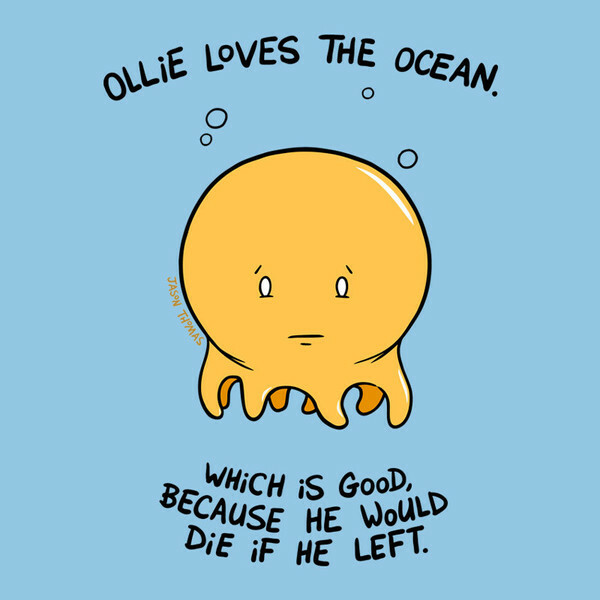 Damn ocean for keeping us apart! Baymax with Mickey Ears! Tomorrowland! Hooray Baymax! Thanks for feeding my art addiction in the fastest way possible! I got lost on Deviant art one time for 3 hours!! Agree with Jenniffer - thanks for showing us these artists' work and giving such great art away, so generous of you! Disney, Doctor Who and dragons ... delightful! It doesn't get much better than retro Disney! Thanks for sharing! You have great taste in art! Awww! The new Disney print is sooooo sweet! Baymax! I have yet to see that movie, but you have reminded me that I desperately need to. I always love art round up. Many new favorites. 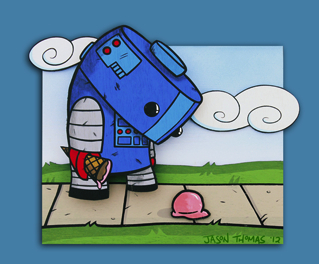 I adore Jordan-Alexander Thomas's robots!! My daughter would love the bright princess cards. I'm still in search of a Rapunzel print with short brown hair though. I love your art choices so much!! 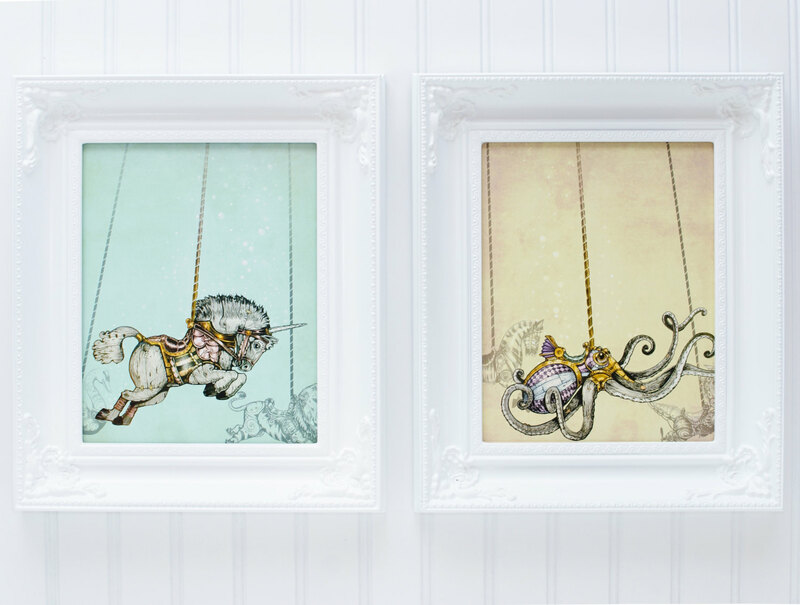 The steampunk carousel prints are so sweet! As always, I'm amazed by the talent that is out there. 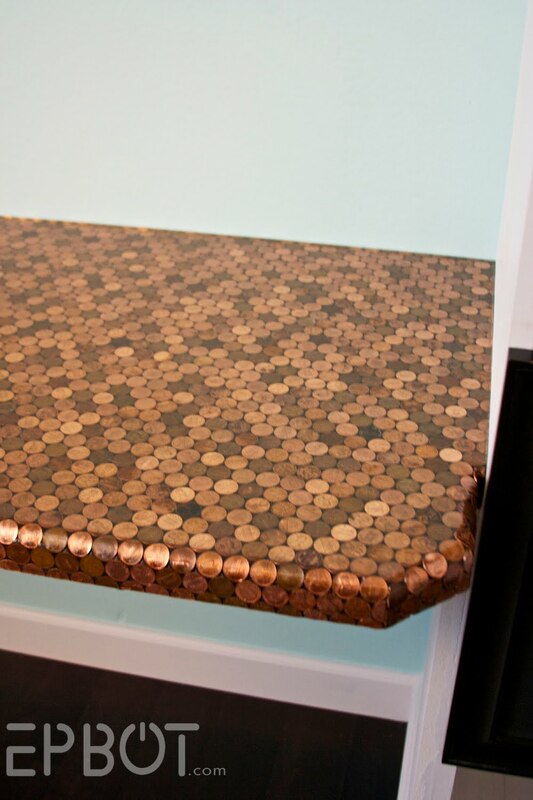 I'm planning a copper and turquoise sea themed bathroom with whales and seahorses. That seahorse print would fit right in! So gorgeous and amazingly inexpensive. Thanks for always finding the best stuff! Oh, I love all the new art this month!!!! 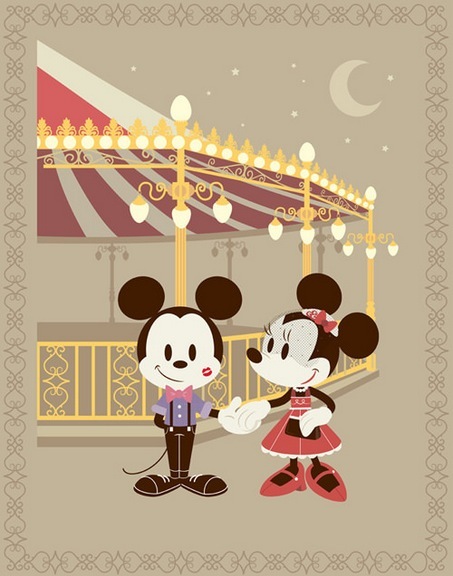 And the Mickey and Minnie with the carousel is *adorable*!! My Dragon-loving son would adore the Toothless print. The new stuff is super-cute! I would love the copy of "Walking Your Octopus" and, as always, the Jack Skellington if he's still there (Pinterest wouldn't let me see the whole board without logging in first). Loving those princess art pieces. So pretty! And those robots are so cool! Sigh, if only I was rich and had unlimited space to display all the goodies. Perhaps this will finally be my month! Art Round Up posts are great because they introduce many of us to art pieces we might never have known about. There are so many great artists out there! Oh em gee! Those prints by Genevieve Kay! GORGEOUS!! That seahorse is perfect, but Mickey and Minnie take the win. :) Love them all. Haven't been to your Pinterest giveaway board in awhile, but I still have my favorites on there. Guess I should go update my want list. Have a great weekend, Jen (and John). OMG Baymax is so CUTE in his ears!! Such cute stuff this week! Baymax!!! Love him and the robot wearing, chocolate cake eating dinosaur! Baymax and Jerrod's prints are adorable!! I love how you've introduced me to such cool art. My office walls are slowly filling up with art and prints I first found here! That made my gloomy Friday much brighter! I love those beautiful hot air balloons! 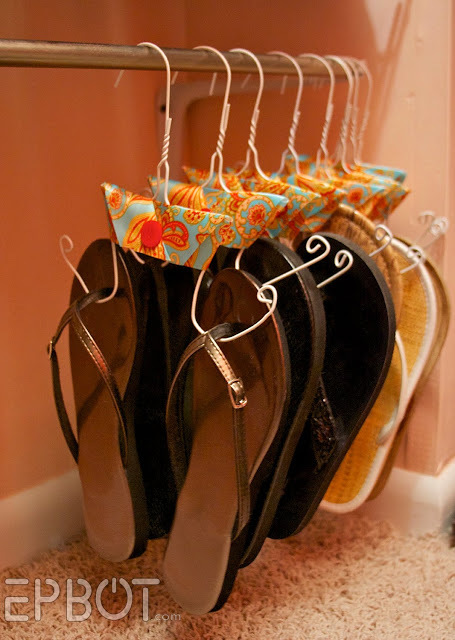 Thanks for sharing (and for feeding my Pinterest addiction)! So much of that I want now,although that's how I feel every month with the art roundups. 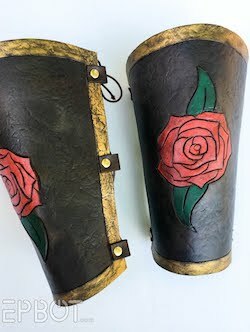 Love your art roundup posts! Awww..Mickey & Minnie! Fingers crossed! 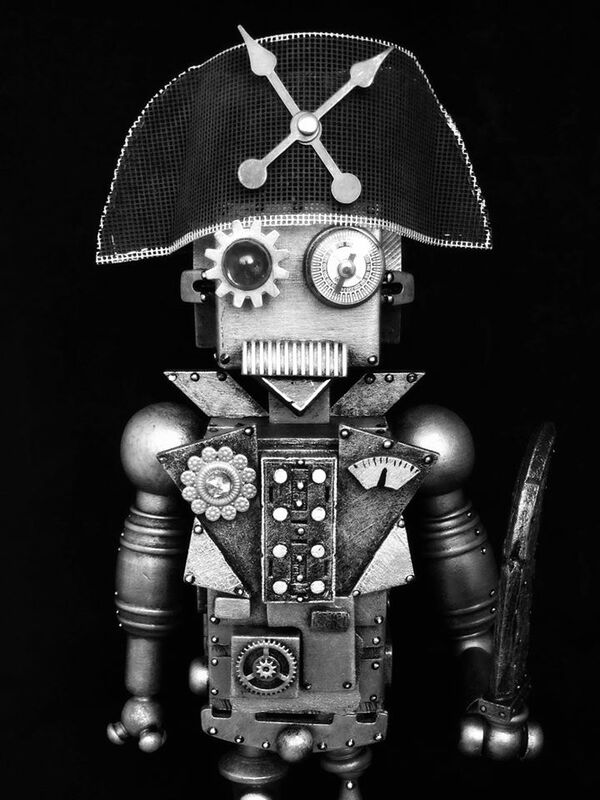 The pirate robot is so cool! Thanks for sharing such fab art. So much beautiful art. Thanks for the pick-me-up on a rough day in a rough week. 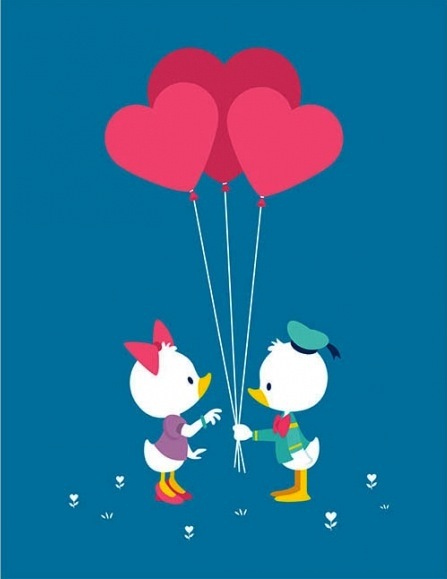 I love the Disney Valentine prints - so cute! And those robots are awesome! Your art roundup posts are my favorite thing on the internet. You always find the best art! Oh, man. 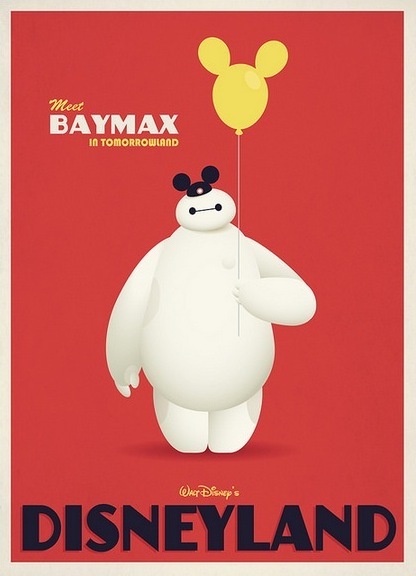 Once again I'm jealous of you living so close to WDW; I have a mighty need for that Baymax print. So much awesome as always! 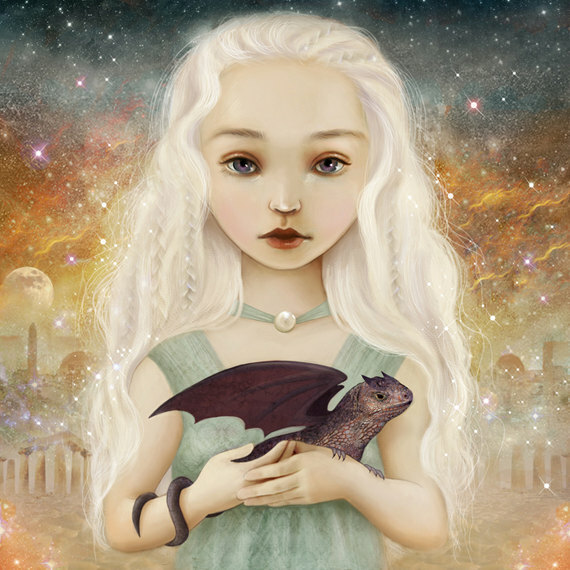 Beautiful Danaerys portrait. 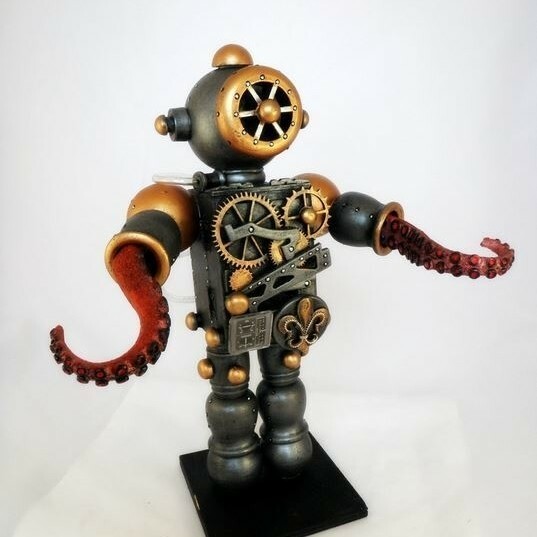 And those robot sculptures are fantastic. Awesome finds, as always. Love Baymax and the seashorse! My favorites! Every once in a while, I have to stop and remind myself that somebody MADE this stuff. Someone's beautiful mind thought it up, and was able to express it so others can enjoy it. I have just about zero artistic skill, (actually, I can make almost anything out of cake and its edible accompaniments, just can't do anything that would be traditionally called art) :o) but these people amaze me with their skill!! Also, I'm off to check out that rocket ship. I have the perfect spot for it. AAAAHHH! 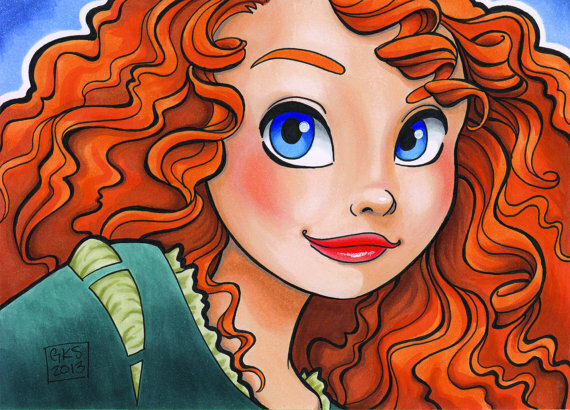 The Merida print is amazing. Always such a rabbit hole with you. THANKS! Lovely, lovely choices. That Rocket Ship is calling to me. 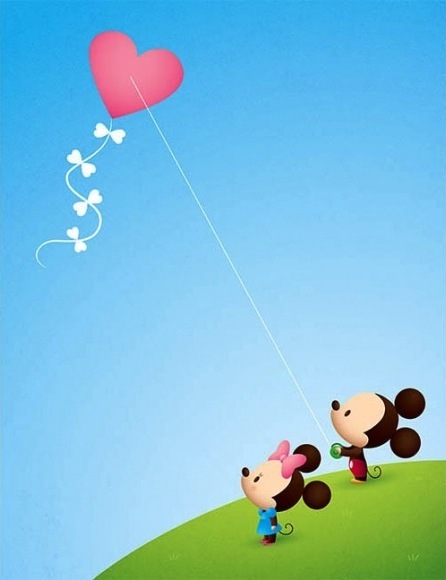 The Mickey and Minnie flying the kite is so cute! PS - I just finished reading Lumber Home from the Red Rocket Farm website. I am bawling in my office. Traumatized I tell you! Love the Jerrod Maruyama one and the Wookie the Chew! Eep! Wow. "If I'm selected, I don't know how I'll ever choose!" Such yummy offerings this time! 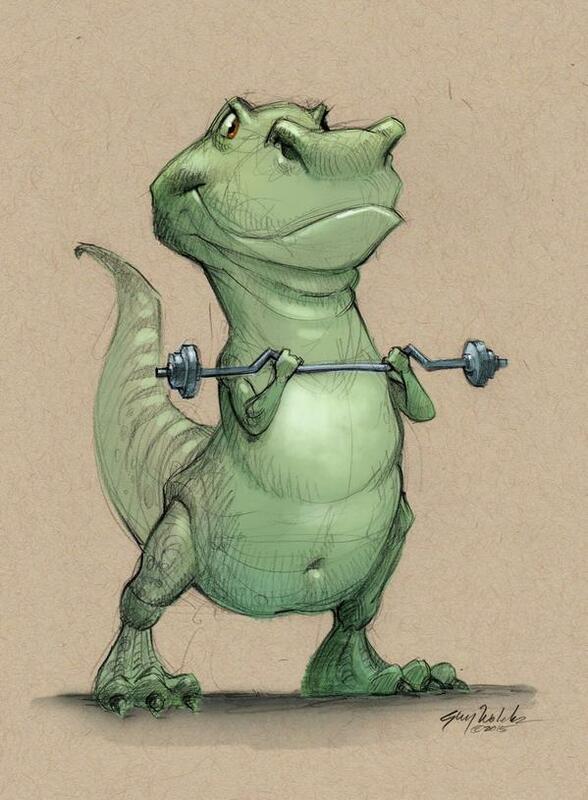 The T-rex doing curls is great. 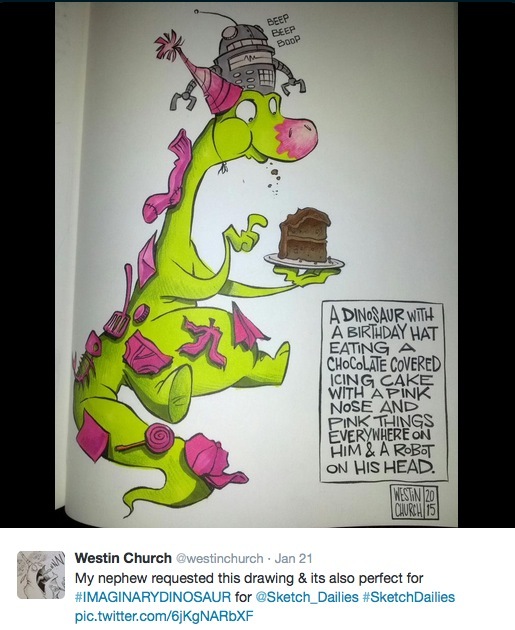 That dinosaur with the cake is so freaking adorable! Love all the artwork! I seriously wish I was half as talented as these artists! I am going through a divorce and redecorating my bedroom to be all me. I am having a hard time deciding where to start with the artwork and not sure I have enough wall space! The Baymax is so cute! I like the Toothless by Nathan Szerdy on your Pinterest board, too. Ollie Loves the Ocean is my favorite! You always find the coolest art to show us! I can't believe the Wall-E print is still available. I'd really, really love to win it. I need to swap my daughter's bed room with my "crafting" room and this print would have a place of honour. I use air quotes, because very little crafting has taken place there lately! Thank you so much for sharing the story of Pilot and Zipper. Just beautiful. As you say...all the feels! Hope John is fully recovered from his surgery! 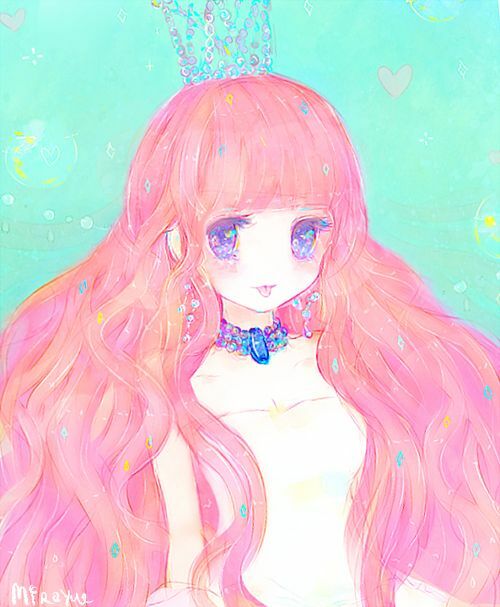 I love the colours on those princess pieces. Gorgeous works and great picks as usual from you! there is so much I would love to look at every day, but I think my husband would confiscate my credit card, as it would delay our planned trip to Prague. You always find the best stuff, so thank you for saving me the time. I love that T-shirt!! Ollie loves the ocean!! So great. The slow loris is friggin adorable as well!! 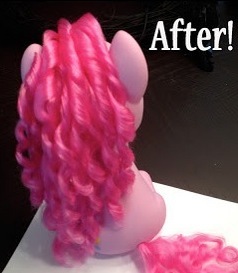 so much to Squee over!! Still in love with the DC Derby Babes!!! So many pretties, not enough wall space for them all! Beautiful - I wish I had your ability to find such beautiful pieces! I love the colors on the pieces this time! So many, but so balanced! And I have been crying for almost 2 weeks straight because of HONY, so those Disney valentines are making me weep. Oh gosh, I just had to go stalk that princess shop! (AND THE BABY GROOT ART BY BIANCA. OHMIGOSH HOW DID I NOT SEE THIS BEFORE? I love love love love love it! Might be a new favorite! Pink dinosaur IS the best. Oh, my GOSH, you've done it again! LOVE all the things!! I was just thinking the walls in my house needed more art (I've been using your blog to find most of the prints already here!) and those carousel prints are so perfect!!! I'm absolutely in love with Big Hero 6, so of course I fangirled over that Baymax print. So cute!! I love that Ollie loves the ocean shirt - my dd would wear that every day! Belle! And I love the Baymax in Mickey ears. I love retro art. With a 4 yo's room AND a baby's room to decorate I could seriously use a piece of that wonderful art you have! Thanks for the opportunity!!! I love all of Jerrod's Disney stuff! So cute!!! Supercute Wombat! And those eyes of khaleesi are amazing! I need to check etsy very soon. Awww, splatbot. :) I love that art you find. I hope I can win one! So much great stuff on the give-away board! I still love the James Hance. And all the Groots. Oh and the Brian Kesinger. I just read "To Lumber Home" *sniff* But...it won't go past Heck turning white...IS THERE MORE???????? Just what's needed at the end of a long week - A Jen Art Round-Up! Also I want that carousel to be real because I really want a go on that amazing octopus! Perfectly romantic styles for Valentine's Day. I agree with some of my fellow commenters: may I please have one of each? 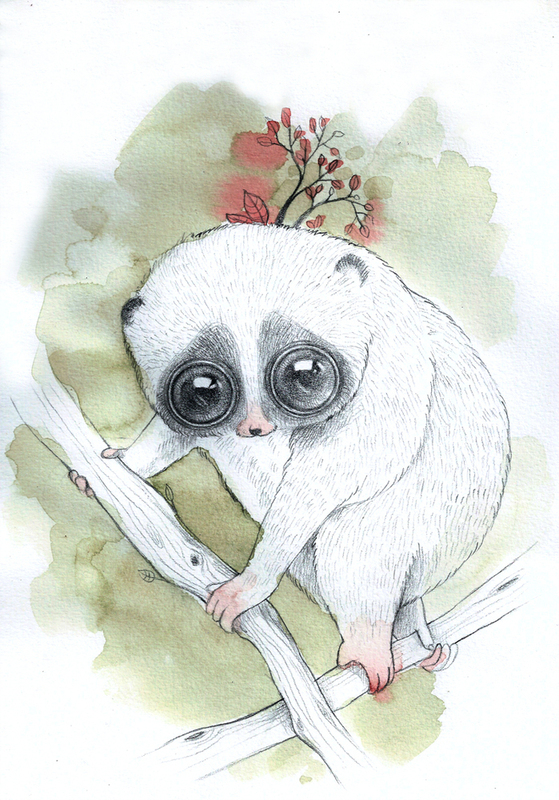 That slow loris is just perfect. Can't believe Chewie & C3PO, original watercolor ACEO by Katie Cook is still up! It's waiting for meeee! 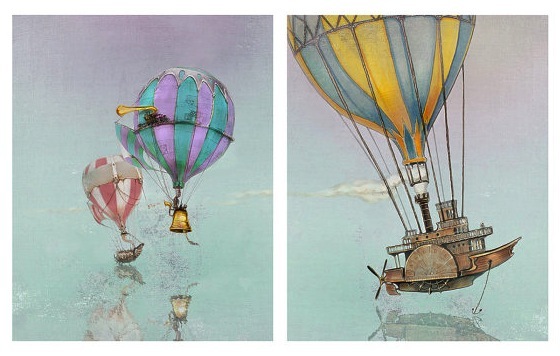 love love love the steampunk carousel prints, they make me want to go to the circus.....with steam. I love the Groot art on your board. And everything else. We still look for art for our daughter's room. Some of these would be perfect! Thanks! Wow, I *love* the colors in the art by Mirayue! Thanks so much for the introduction, so to speak! Wow, I think this is my favourite roundup so far, I love everything! And I'm glad for the nudge back over to your pinterest board, I haven't looked in a while. I adore Rocket to the Moon. 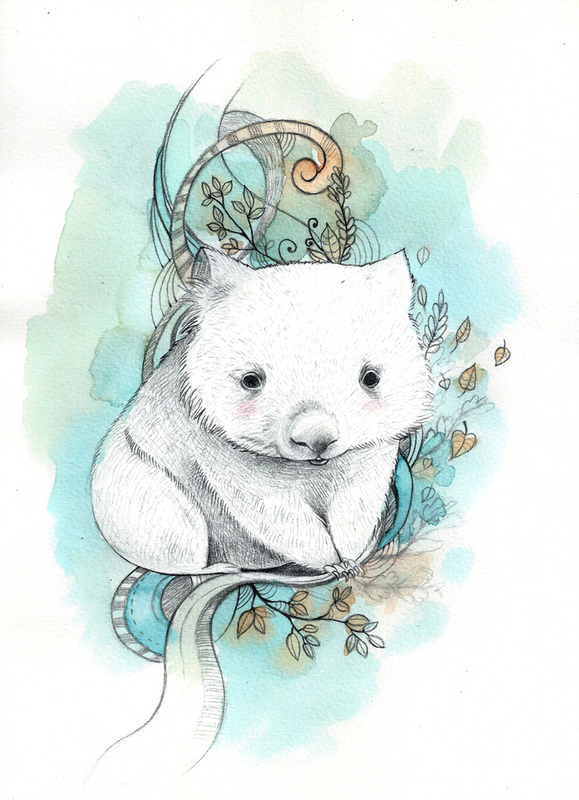 I'm absolutely in love with Lisa Falzon's art! It's colorful and gosh-darn cute! And want to throw in my hat for a chance at the Toothless print! You find the best art! I love the art round-ups. Love the Ollie tshirt and the Art Board gets better and better! I still love the TARDIS Believe print and the Fairy Den. the wombat and slow loris are TOO CUTE! So many pretties! How can I pick just one? 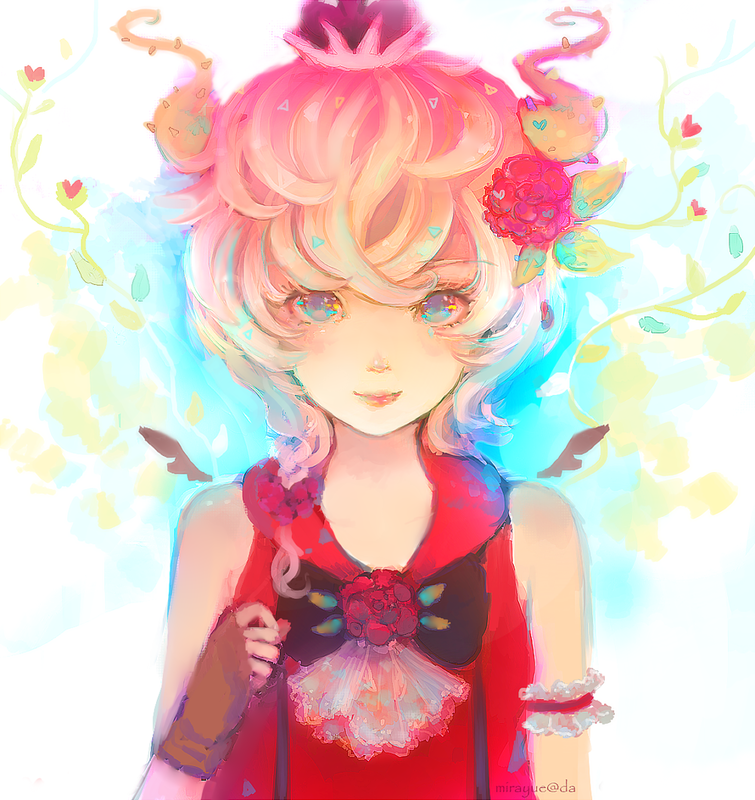 Wow, Mirayue's stuff is so amazing! I would love the Rocket to the Moon. That piece is so beautiful and every time I see it I go look up what NASA is up to. I'm loving all of the dinosaurs and robots in the art roundup this month!